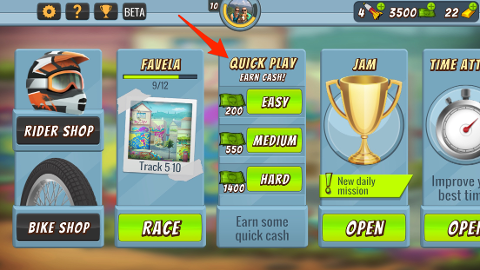 Quick play is a great way to get right into racing and earn some cash! In Quick Play you are paired up against another player's time on a random track. You'll see three difficulty levels, ranging from easy to hard. The difficulty level determines how fast your opponent's time is. Win the race and you'll earn the cash prize that corresponds with that difficulty level. The harder the difficulty, the greater the cash prize. Quick Play cash prizes increase as you progress through the game. Quick Play is a great way to earn currency for some bike upgrades or new gear!